I was a late convert to audiobooks. I only started listening to them about two years ago when I had a one-hour commute to work, and I’ve kept up the habit since moving closer to my office. On the whole, it’s been a mixed experience. Some books work really well, but others don’t, and I wonder if the problem is the book or the medium. Are some books just not suitable for listening? 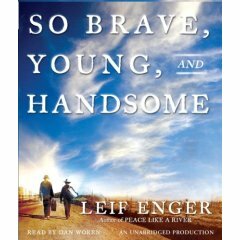 Leif Enger’s first novel, Peace Like a River, is a favorite of mine. It’s beautifully written and explores two of my pet topics: father/child relationships and the supernatural or divine providence in daily life. So I was excited to see that Enger had finally written a new novel. When I saw the audio version for half price at my favorite bookstore’s going-out-of-business sale, I had to pick it up. The new book, So Brave, Young, and Handsome tells the story of Monte Beckett, a novelist struggling to write a follow-up to his wildly successful first novel. Partly to escape the frustration and shame he feels at failing his family, Beckett takes up with the former outlaw Glendon Hale, who is journeying to Mexico to see the wife he left behind when fleeing the law years earlier. It’s a story of the road, the Old West, heroes and outlaws, family and forgiveness. Unfortunately, I think I missed a lot of what is great about this story by listening to it instead of reading it. At times, I couldn’t quite follow the action. For example, Monte at one point is captured by the ruthless Pinkerton Charles Siringo. My reaction was “Huh? How did that happen?” And that’s the trouble with audio. I listen to audiobooks in the car, and there are, obviously, times when I need to put my whole mind on my driving. When I miss a crucial paragraph in a book, I can easily look back and reread what I didn’t read carefully enough the first time. Audio doesn’t work like that. You have to skip back and then listen to everything over again. And if you’re like me, you then realize that you didn’t skip back quite far enough! I had this problem a lot with this book. It’s so rich with descriptions and characterization that I often couldn’t figure out where to skip back to if I lost the narrative thread. I enjoyed the book, but I don’t feel like I really got the full experience. In the last year, some of my most successful listenings have been Nineteen Minutes by Jodi Picoult, The Constant Princess by Philippa Gregory, Miracle in the Andes by Nando Parrado, The Girls by Lori Lansens, The Know-It-All by A. J. Jacobs, and The Birth of Venus by Sarah Dunat. None of these what I would consider great literature; I wouldn’t strongly recommend any of them, except maybe The Girls and Miracle in the Andes, to friends. But what they have in common is that they all tell diverting stories, and the writing isn’t really complex. If I missed something, I could quickly pick up on what was going on without going back. On the other hand, I don’t feel I really read The Book Thief by Markus Zusak or Suite Francaise by Irene Nemirovsky. The writing style in both books is so dense and complex that the books require much fuller attention than I can give to audiobooks. They both seemed very good, but I really can’t be sure because I kept getting confused. The only exception I can think of to this simpler-is-better principle is The Road by Cormac McCarthy. I cried and cried when listening to this book, but I think it worked because I listened to it during a long drive down a pretty boring highway. There wasn’t much to distract me, and I could give the book something close to my full attention. I’ve also had some success with rereading on audio. That’s been a great way to revisit old favorites that I don’t have time to read in print. I might start doing more of that. I’m curious about others’ audiobook experiences. Do certain types of books lend themselves to the audio format? What are some of your favorite audiobooks, and what simply didn’t work? I like your idea of “rereading” on audio — you know the plot then and won’t have to worry so much about details, and so it’s easier to focus on other things the book offers or to let your mind wander if necessary. I “reread” all of Austen at one point, and it was a great experience. Cormac McCarthy’s All the Pretty Horses is one of the best things I ever read on audiobook, so maybe he just works well that way. Another good example was Lonesome Dove: plot-heavy and not too elaborately written. I find that what makes the biggest difference to me, both in terms of comprehension, concentration, and enjoyment, is the narrator. A great narrator makes a great audiobook, period.